Our basement may be a complete disaster, but dammit, we want it to be a well lit disaster!! Ever since we bought our house in 2003, we've been fighting a bit of a losing battle in our basement. This narrow but long space plays quintuple duty on a daily basis. Storage, laundry, utility room, server closet, and shop. Oh how we long for the early days of a nearly empty basement area. Though it may have been virtually empty when we bought our home, we quickly took care of that quality of the space and built some shelving for storage and a little work bench from plywood and 2x4s. In the years that followed we've ended up with so much stuff down there that, at times, we can't effectively get around without having to act like we're on American Ninja Warrior! Wendy accuses me of treating it as my hoarder's lair. At times, she's not entirely wrong. Aside from all of the crap, the thing about this basement is that it's always been pretty dark. There are a few random bulbs and four mismatched 4' fluorescent tube lights that are run from two different switches. These switches are also inconveniently located at either end of the basement. It's a set up that's less than ideal, and the lights have this horribly annoying buzz that just.never.stops. After we grew tired of the old school glass tubes flickering and dying, and then inevitably breaking them because I procrastinated taking them to the store for recycling (it happened twice, and was horrible both times), we wanted to upgrade things by adding some LED replacements. 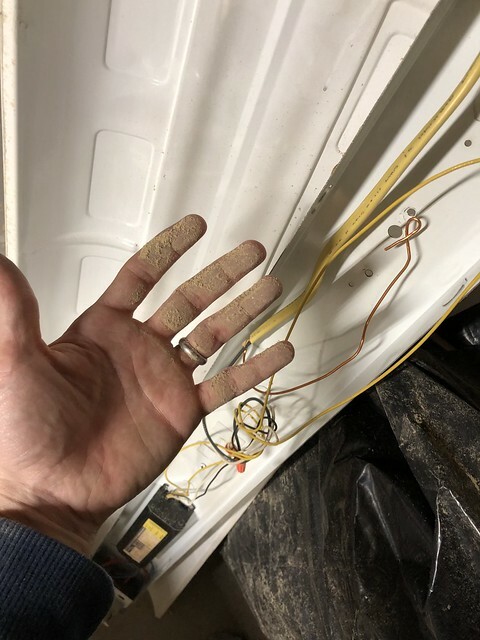 Unfortunately, these LED bulbs caused the transformers in two of the lights to constantly overheat and shut themselves off as a protective measure. Add to it that the LED bulbs I was using seemed to have a high failure rate...which means the pins broke after less than a year of use and threw me into a fit of irrational rage yelling. "THEY WERE SUPPOSED TO LAST FOR 30,000 HOURS!!! THIS IS SO MANY LESS HOURS THAN THAT!!!!" Rather than continue to be frustrated by our dank basement with insufficient lighting, we determined it was about time for a little upgrade. We decided to buy eight 4' LED low profile lights from Hyperikon to replace the four fixtures already in place. 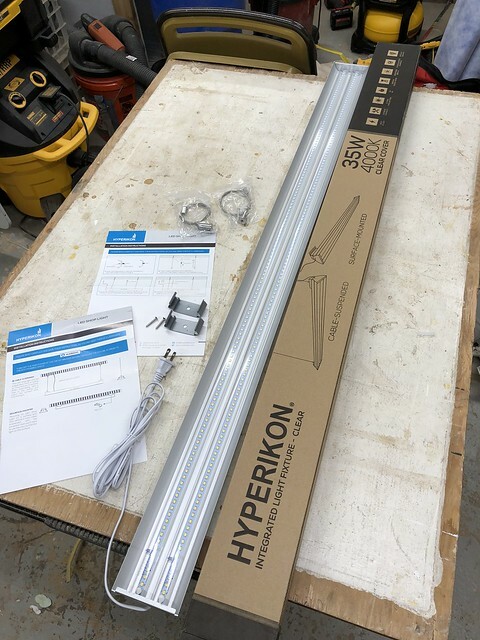 We ordered the lights we're installing from Amazon, and all in we spent about $240 on the eight fixtures, which are all non-linking plugin models. There are a ton of options available on Amazon, but we went with these lights for several reasons. 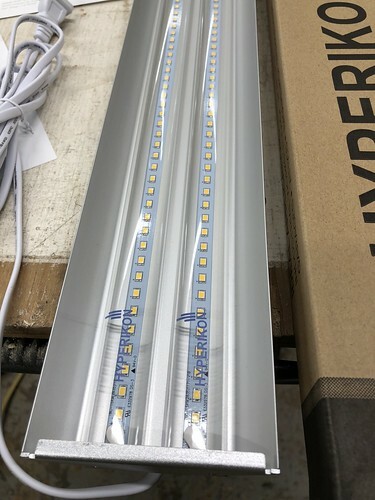 These were affordable models and the light output is more than sufficient at 100 watt equivalent, 3800 lumens, and a relatively warm color temperature of 4000K. 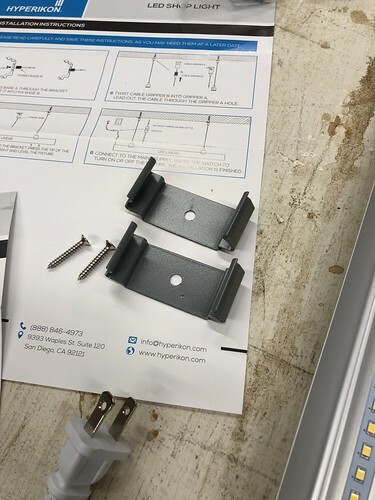 We chose the plugin style fixtures knowing that it would allow us to move lights around in the future without much effort. Using wire ties to make sure any wires are nicely bundled and out of the way and we have a flexible and future-proof solution no matter what we do with the basement. 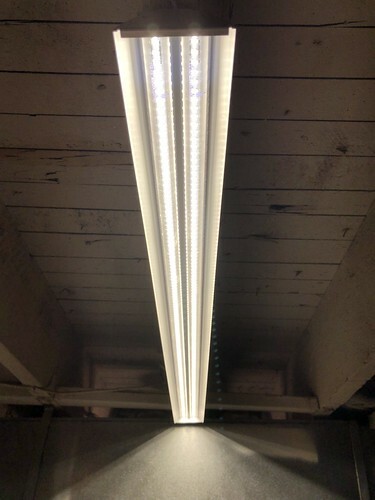 The lights themselves are LED strips protected by round plastic coverings. The whole fixture can be either hung form the ceiling or surface mounted with low profile clips. 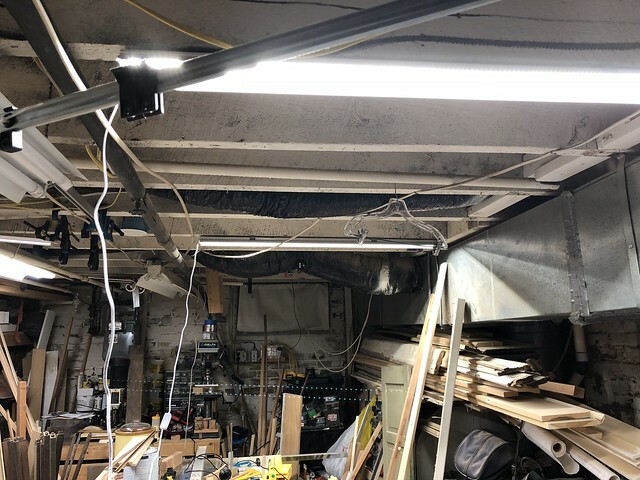 The first step in our new lighting game was to mount two of them in place so we wouldn't be working completely in the dark when we removed the old lights. For our purposes, we're mounting them directly to the underside of the exposed floor joists in the ceiling above, so it only required us to screw in the two clips and snap them in place. 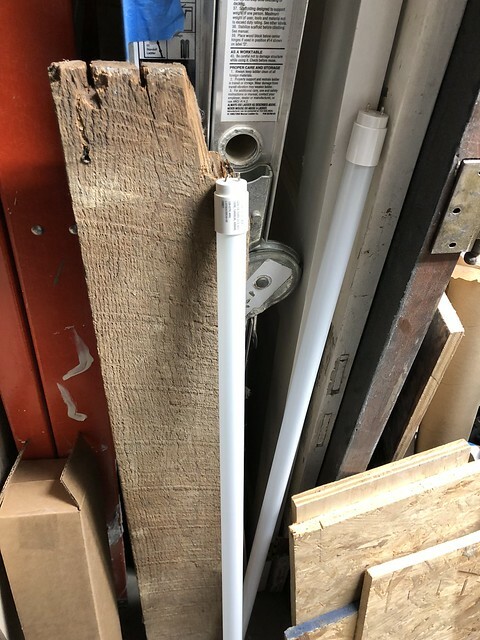 Install of these lights could not be easier. They snap right into the clips and all you have to do is to plug them in to fire them up. 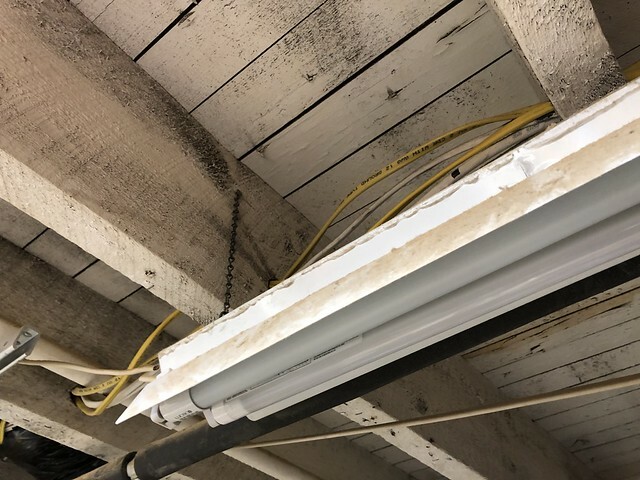 With adequate partial lighting, the next step in our task was removing those old terrible florescent lights so we could install the six remaining new lights. 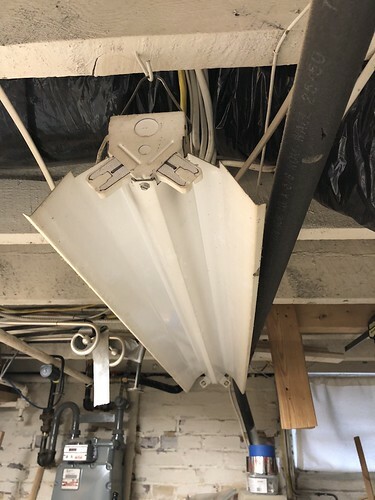 These old lights were all poorly hung at various heights. Besides the fact they were absolutely filthy, they also were either close to failure or had completely failed. 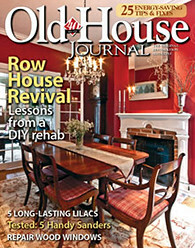 The old lights ran from the front to the back of the house, mounted across floor joists. With these new lights in place along the joists, the basement actually feels a little larger, and like the ceiling is higher. As I mentioned, the lights are 35 watts each and come in at 4000K, so their color temperature is pleasing and not too blue. I feel like any higher than 4000K just ends up feeling way too cold and unnatural. They're also rated for 50,000+ hours and come with a 5 year warranty. That sounds great and all, but the risk with LED lighting isn't that the LEDs will last, but that the circuitry will last. I'm hopeful that these lights will be the last we'll ever need to buy for the basement. With regular use, we're looking at about 20 years or so of life in these lights. 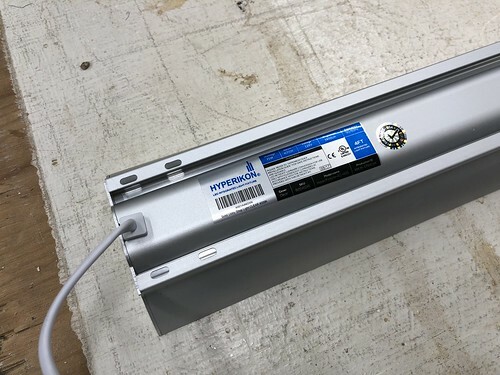 As part of the install process we also changed up the outlets in the ceiling that the lights plug into so that they're all on the same switch. Wait, one switch to turn all of the lights in the basement on and off? 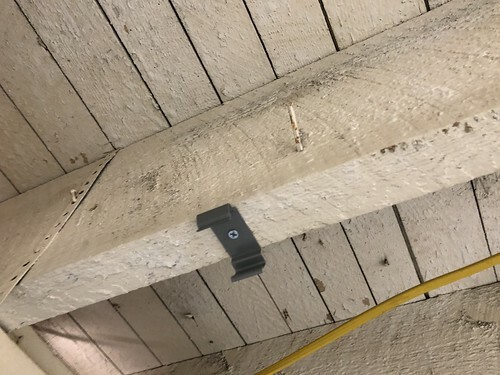 So I don't end up all of the way upstairs when I realize that the switch at the other end of the basement is still on and needs to be turned off? What a crazy idea! We've had these lights in place for a little more than a week now and I can't believe how much it has improved the basement's usefulness. I can see the projects I'm working on so much better now and really look forward to spending time getting things done, even when it's completely dark outside. Honestly, I can't believe it took us this long to make this relatively simple improvement. 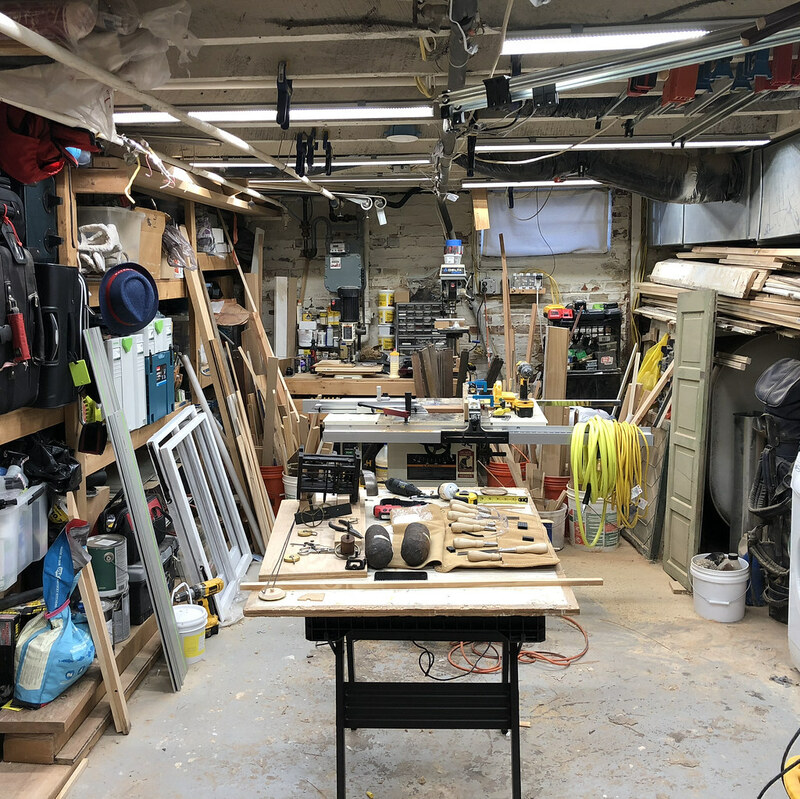 I do have to say, having this much light in the basement has me looking around and contemplating a major reorganization and rebuild to make this space a true shop. I'll have to convince Wendy, but maybe moving the washer & dryer, shrinking the storage, and finally removing the old and unused oil drum would give us the functional space I've wanted for a very long time. 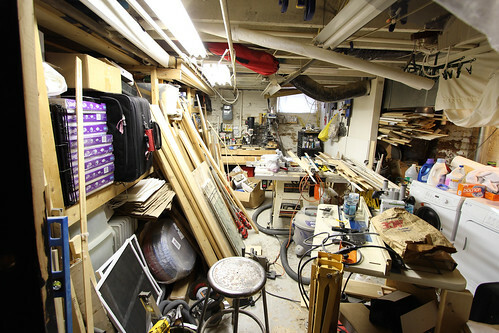 We've talked for a long time about finishing the basement, but I would hate to lose our very functional workspace. Maybe an update that's not quite a finish? 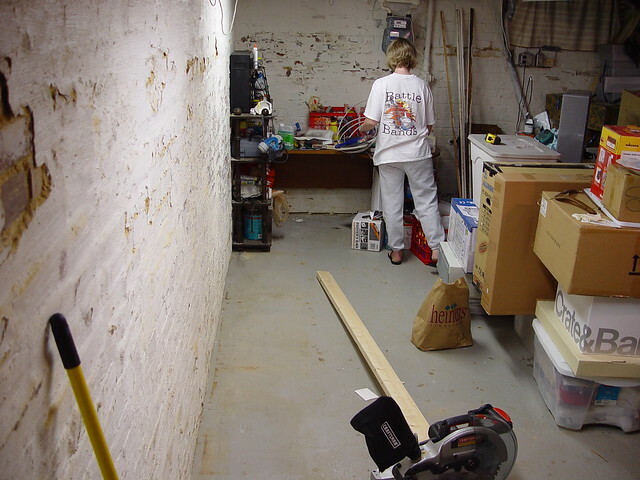 The total space of the basement is 15' x 30', which would make a very functional (albeit narrow) shop space. What do you think? 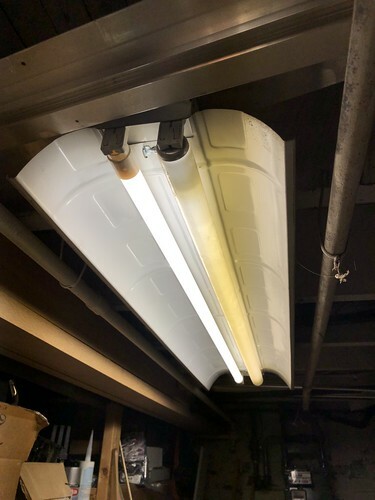 At any rate, these new lights are a breath of fresh air here in the basement, and I'm so glad we made this relatively inexpensive change. It's probably a 2 out of 10 on the DIY difficulty scale, so if you've been procrastinating additional task/work lighting in your work space, the technology and price point is in the right place for you to finally take the plunge. 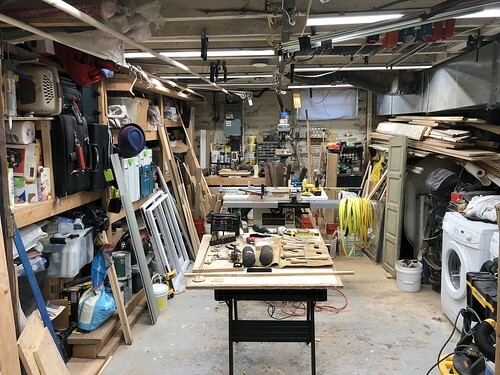 Don't convert your basement away from a workshop until everything else at your Alexandria house has been completed. Then you can transfer your workshop to the foursquare. If you were to remove the laundry functions, where would you move the laundry room? I think you'll be very happy if you move your laundry elsewhere (do you have some place else you can move it?). And yeah, that useless oil drum needs to go. Another great functional improvement, and the lighting looks so even now. Nice touch keeping it on the warm side. But, c'mon, a useless oil drum? Offer it for free on CL or freecycle. And hope you can really improve the laundry area. Looks like a shop area is just on the horizon. Will watch IG stories for more refresh updates! Great functional upgrade! Funny how we forget we're sometimes working in less-than-ideal spaces... I for one vote you create a shop space. Selfishly I hope to read all the posts on your eventual research, design, and execution of such a space. Many of us have small basements and could benefit from your expertise! If not your wry humour in the telling. Lol. Here comes another great functional improvement, and I must say, the lighting looks even now. About that oil drum, release it and let it go, please.